When basketball player Kobe Bryant takes the guest seat on The Tonight Show Starring Jimmy Fallon this evening (March 19), it’s not as if his new book’s sales will be languishing. 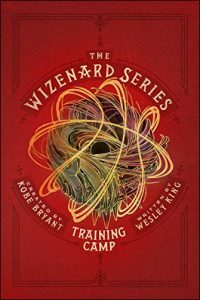 Releasing today from Granity Studios Books, The Wizenard Series: Training Camp arrives (at this writing) at No. 4 in the Kindle Store and No. 28 in books in Amazon’s Children’s Basketball Books category. Bryant is billed as the book’s creator and Wesley King as author. As Logan Newman at USA Today has written, Bryant has said the idea of a YA novel based in basketball and magic came to him during his NBA career’s last training camp. The book introduces readers to a struggling inner-city team, the West Bottom Badgers, and the impact on them of a new coach who seems to be pulling off some magic, Professor Wizenard. The tale is structured as a kind of latter-day Rashomon, with a 10-day span of training camp being described by each of the five players differently from the perspective of his own challenges. While Fallon and Bryant talk about the book and its message during the television show, Granet, a producer for The Tonight Show, will be watching for the kind of sales dynamic most publishers and authors might experience as pretty magical: a jump in sales rank from the appearance. “We weren’t really paying attention” to the impact that an appearance on the show might have for an author, Bederman tells Publishing Perspectives, until July last year when Fallon’s guest was David Spade talking about his audiobook A Polaroid Guy in a Snapchat World from Audible. “And David Spade emailed us and said, ‘I have to tell you, this is crazy, after I came on your show, my book popped up'” in the rankings. Here’s a look, courtesy of Bederman and the Fallon show’s team, at some of the jumps they’ve been tracking in the Top 100 rankings on Amazon.com when authors appear on the show with Fallon. Originating in the States, The Tonight Show Starring Jimmy Fallon has more international reach than some realize, giving publishers and authors a vast range of audience exposure. 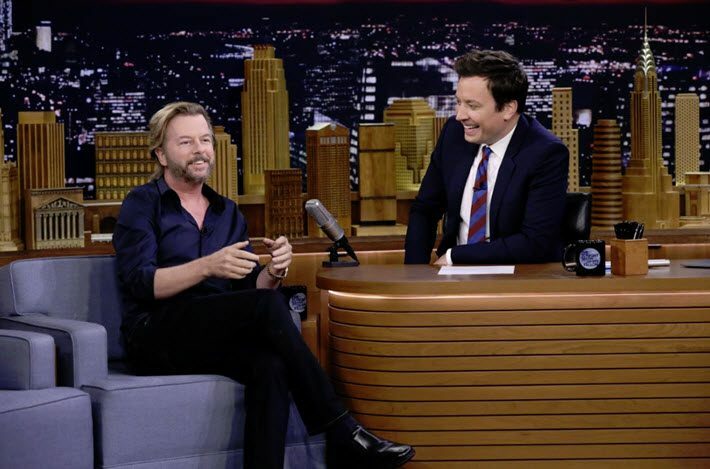 No sooner had Fallon taken the chair than the show premiered in Australia. It’s also been seen in Belgium, Brazil, Canada, Middle Eastern and North African nations through OSN First Comedy HD, France through Canal+, Germany, Italy, the Philippines, Portugal, parts of Southeast Asia, Sweden, and the UK. Bederman’s background prior to her work with the Fallon show includes stints with MTV News, VH1, NBC’s Last Call with Carson Daly, the Sundance Channel, and AMC. And while it might seem that the mere exposure value of an appearance on the show would be enough to boost a book’s spot in Amazon’s Top 100, she says that Fallon’s own engagement with book segments is also driving the response. This was put to a more extensive test last summer with the first outing of The Tonight Show Summer Reads program. Viewer votes selected Tomi Adeyemi’s epic fantasy Children of Blood and Bone (Henry Holt, 2018, the first of the two books in the Legacy of Orïsha series) from a starter list of five titles for the club’s focus. Bederman also points out that the context of Fallon’s audience is especially conducive to a mass-reading event like the club. “Our audience is very young,” she says, “a great young demographic. Bederman says that Fallon and the show were fully pleased with how the book club went, but doing it meant that the whole show team was involved, “and Jimmy likes to be very hands-on with it,” so the demand on resources so far has made it something that’s not practical to keep rolling as a regular feature. But the team would like to see another iteration of the club, she says, another event expanding on the author ongoing author appearances that basically follow the main release rhythms of the trade publishing year. Kobe Bryant’s appearance on the show tonight is the fourth book-release segment of the season, and two more now have been scheduled. While Jimmy Fallon’s attention to books and authors may be a newly demonstrable gold standard for discoverability in the books industry, it’s clear that the staff support he’s getting is helping to power the show’s effectiveness for authors and publishers. Bederman is coming at it from a place of personal commitment. No surprise that Fallon’s desk is a good spot for Kobe Bryant tonight, with his and Wesley King’s books’ messaging for younger readers. Below: video of the Chelsea Clinton appearance on the show on October 2. More from Publishing Perspectives on book marketing is here.